With its legacy of more than 50 years of fine winemaking, the Robert Mondavi Winery is a shining symbol of Napa Valley. Founded in 1966, the winery's beautiful architecture by Cliff May reflects the missions of early California history. When you come to visit us at Robert Mondavi Winery, you will experience our commitment to education and the arts, pursuit of innovation, and dedication to producing fine wines that stand in the company of the great wines of the world. Come learn about the history of winemaking in California and share in our philosophy of integrating wine, food and the arts into gracious living. Elegant and sophisticated yet warm and welcoming. 3 different tasting rooms: Vineyard Room, Spotlight Club Room for Wine Club Members, and To Kalon Reserve Tasting Room. Wine Education: Comrehensive tour and education program available for all levels. Food Available: Contemporary American Cuisine prepared by Winery Chef Jeff Mosher. To join the wine club, visit www.robertmondaviwinery.com or call 888-766-6328. •	Exclusive access to our Spotlight Tasting Room for the member and up to three guests. •	Complimentary Signature tours for the member and one guest. •	Complimentary tastings at all of our partner wineries. •	Invitations to exclusive wine tastings, dinners and special events. •	A 30% discount on club shipment reorders. •	Discounts on winery concert tickets. Complimentary glass of Napa Valley Chardonnay or Napa Valley Cabernet Sauvignon for local resident and one guest in our Vineyard Tasting Room. Robert Mondavi Winery is certified under the Napa Green Winery Program by the Napa County Department of Environmental Management (DEM) and the Association of Bay Area Government’s (ABAG) Green Business Program and completed all the regulatory components needed for environmental sustainability. These components included developing water and energy conservation methods, preventing pollution, and reducing solid waste. In addition to developing sustainable winery practices, this program is set to become the standard for the state of California. 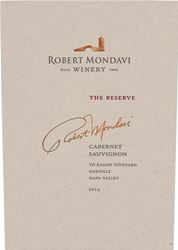 Robert Mondavi Winery is certified under the Napa Green Certified Land Program. Robert Mondavi Winery has created and implemented a customized farm plan with measured results that addressed all aspects of its property, vineyard land as well as non-farmed land, including practicing soil conservation, water conservation, stable drainage, riparian corridor enhancement, fisheries and wildlife habitat enhancement and long-term improvement and sustainability.